Ajatuksia 40- vuotiaan Vanhan Sielun elämästä, joka jakaa aamukahvinsa smaragdisilmäisen Maljojen Ritarin kanssa. Kuun valossa kuuluu sateen ropinaa ja sydämen ääniä. Rajatieto, tilkkutyöt, Suomen luonto sekä suloiset karvakorvat sulostuttavat ah niin ihanaa Elämää. Sometimes family members /take stress out on each other, so you may feel angry or hurt by a brother or sister (or a close friend). Instead of fighting with them, first take a moment. Can you see the best within them? Can you think of a time when you felt a lot of love for them? By thinking and feeling love toward your brothers and sisters, you can all get along better. The more unlovable someone is, the more they need love. When people get angry at their loved ones, they do so because they don’t know how to control the stress in their life. They might be angry with their teacher or boss and feel like they can’t do anything about it. So, they take the anger out on the people they live with and that might include you. You may do the same thing to your family members without knowing it. Deep down, you all love each other. Family members always have love, but sometimes this love is hidden by anger. It doesn’t feel good to be angry with your brothers and sisters, even if you have a good reason for the anger. Can you forgive them in the name of peace? Can you be the first one to say “I’m sorry” or “I love you”? 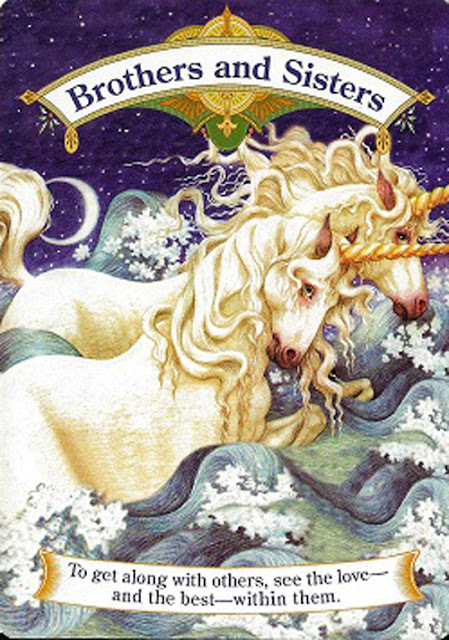 By drawing this card, the unicorns want you to know that your brother, sister, or friend really needs your love and understanding right now. You have the power to help everyone get along. Olen 40- vuotias Vanha Sielu maaseudulta, joka harrastaa henkisyyttä, tarot-kortteja, kirpputoreja ja käsitöitä. Pidän väreistä ja valokuvista, matkustelusta ja ihmisistä. Luvassa tajunnan virtaa sillä haluan jakaa tämän kosmisen yksinäisyyteni juuri Sinun kanssasi.